Alf Casino is a new project from the well-known company Araxio Development N.V. The website is made in a cosmic style that unites various heroes from the thematic planets of Atlantia, Amazonia, Titania, Luft and Fire. As planned by the developers, during the registration process, players choose a character for themselves and develop their abilities during the game. At the same time, the level of the loyalty program increases, which brings a lot of lucrative bonuses. The casino hold license issued by Curacao Government. The website interface is translated into English, Russian, Swedish, Portuguese, Finnish, Norwegian, Turkish, Belgian, Polish, Hungarian and German. The list of game providers includes popular brands: Ainsworth, Thunderkick, Yggdrasil, NetEnt, Endorphina, iSoftBet, BetSoft gaming, ELK, Pragmatic Play, EGT, Red Rake, Ezugi, Habanero, GameArt, Igrosoft, Quickspin, Push Gaming, Amaya Evolution Gaming. All casino games are divided into following categories: New, Popular, Slots, Card. Live dealer, Poker, Favorites, Blackjack and Video Poker. Alf casino game collection consist of over 1300 games for real money and includes 1100 slots, 30 types of video poker, 100 table games, 16 live dealer games. A fairly wide game collection sets the bar high for the development of a new brand in the field of gambling. Alf casino offers new players the opportunity to familiarize themselves with the casino games without any risk, playing for fun in demo versions. Demo versions are available for all casino games except Live dealer games. 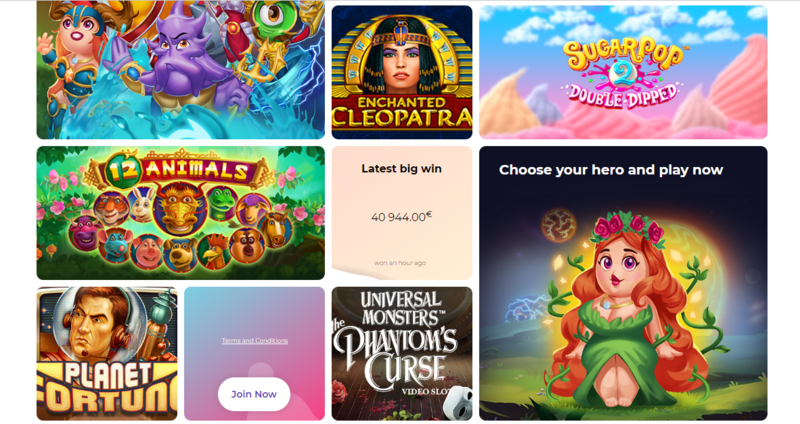 This new online casino is catching up with the leaders of this industry, offering its players various competitions, promotions, tournaments where you can earn impressive prizes. The casino also generously gives bonuses to new and existed players. All new players are eligible for a 100% bonus up to 770 CAD on their first deposit plus 200 free spins. New and regular players can get weekend reload 50% bonus plus 50 free spins. This bonus is available for every first deposit on Friday, Saturday and Sunday. All winnings from bonus money are subject to x30 wager. In addition, players can enjoy up to 15% (up to 4600 CAD) cashback depends on their status. There is also a loyalty program where players can earn loyalty points to get bonuses, as well as a VIP program that can reward players up to 15% in cashback, financial benefits, personal VIP manager and special VIP bonuses and promotions. GET YOUR BONUS NOW. In order to fund an account at Alf casino, you can use the most popular payment systems: MasterCard and VISA, Bank transfer, Skrill and Neteller, Payeer, Paysafecard, Zimpler, as well as payment services such as Ecopayz, and Bitcoin. The minimum deposit to get the bonus is 30 CAD. There is no commission for deposits. Money is credited to the account within a few minutes. Alf Casino operates under a license issued by the Government of Curaçao. It is also worth noting that the website has an SSL data encryption system. That means any personal and financial data is hidden from third parties. Another guarantee of honest and transparent work is casino’ cooperation with top branded and trusted game providers. The website is stylish and colorful. Overall, Alf casino is a modern and original bitcoin casino that pleases gamblers with a unique selection of games and lavish bonuses.